“In The New Order of Things … There is No Room For the Old Saloon”. Reading some of the pro-Temperance literature of the 1920s, one is reminded of the many talented people enlisted in the cause of no-alcohol. They ranged from ministers of the cloth to physicians to educators to politicians – and ordinary people. Robert Everett Corradini should be remembered, because he wrote and spoke eloquently in this cause. Even if many, perhaps most today, won’t agree with him, the intelligence and hard work behind his commitment are obvious. The book I mentioned from 1924 in the previous post chronicled the passing of the saloon in New York City. It is relatively short, really a photo-essay, but I now see it was part of a series of books he wrote, at least four, which came out in 1924-1925. One looked just at the changeover of the saloon all along Broadway in New York. It examined how the closing of the bars affected neighbourhoods which were quite different and was preceded by a penetrating historical sketch of New York and its ethnicities. The Manhattan focus of the books makes sense, not just because his employer, the World League Against Alcoholism, was based there on 5th Avenue, but because as he noted in the above extract, Temperance was primarily an achievement of Main Street America and Broadway was its obverse. He understood that America was founded mainly by rural-based Puritans seeking religious freedom, while New York was founded and developed by people with primarily mercantile goals and settled by a heterogenous population of diverse origins and values. He rightly saw that New York was a premier battleground on which the fight for permanent Temperance would be fought, hence his keen interest in its early results there. In adverting to the ethnic issue, he was thinking no doubt mainly of the large Italian and Central European populations in the city. He did mention also the Jewish population, and made clear that while sobriety was a value traditionally associated with the Jews, their neighbourhoods were not exempt from the depredations of the saloon and liquor merchants. He viewed retreat of the drink merchants from all these neighbourhoods as salutary, in other words. 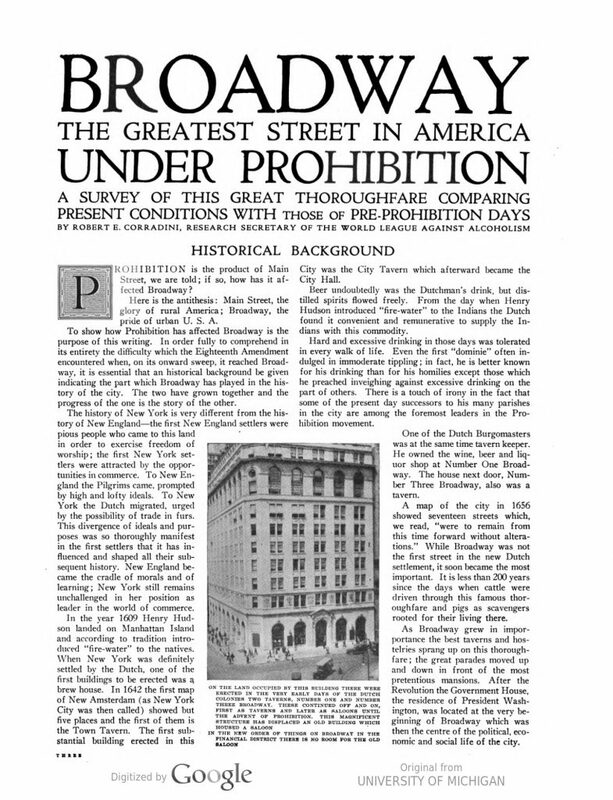 His main book, 1924’s Saloon Survey New York City, was a detailed statistical examination of various liquor and sociological issues five years after Prohibition. It looked for example at the number of shops selling distilling equipment or wine for sacramental reasons, at the incidence of illegal public drinking, the new uses the old saloons were put to, comparative rates in hospital admissions for drunkenness, and the effect on real estate values of saloon closures. He often sought to show the new businesses employed more people than the saloons had. Robert E. Corradini was born in Madison, NJ in 1891 and died in Elmira, NY in 1972. He appears to have had some training in statistics and studied in Switzerland during WW I. In later life, it seems he was a minister, but certainly for many years he was associated primarily with various anti-addiction causes. In the 1930s he was still writing books on addiction, one dealt with narcotics and youth and had significant influence. With Repeal in 1933 his work broadened to take in the drug issue. He was frequently quoted in the press in the 1920s on issues such as crime and Prohibition (did Volstead reduce crime, increase it, etc.?) and appeared before Congress. In this period, he was in the research department of the World League Against Alcoholism, an outgrowth of Ernest Cherrington’s Anti-Saloon League. The World League Against Alcoholism withered after alcohol came back in ’33 but Corradini continued his work with groups whose broader remit was to control narcotics. The Anti-Saloon League still exists, incidentally, but under a different name. My sense is after WW II Corradini mainly focused on his ministry, but I am not certain. Reading his and other “agit-prop” of the era, one cannot fail to remember the price alcohol does exact from society. It always did and it still does, while providing enjoyment and interest to many. Its important role in the economy and public finance must be recalled as well. The anti-drink crowd had a good argument, and perhaps in a perfect world there would be no drink. But in a perfect world, no one would ever take sick, die, hurt, or suffer in other ways. The world is not perfect and for better and worse alcohol is part of it. Note re image: The image above is from Robert Corradini’s book dealing with the effects of Prohibition on Broadway in New York, via HathiTrust, here. All trade marks and other intellectual property therein belong to their owners or authorized licensees. Believed available for educational and cultural purposes. All feedback welcomed.